Disney Fastpasses are a must for smooth touring around the parks. It is an excellent system that they have put in place that allows you to speed through the line for at least 3 rides per day. You can get even more than that if you know how to efficiently use the system. 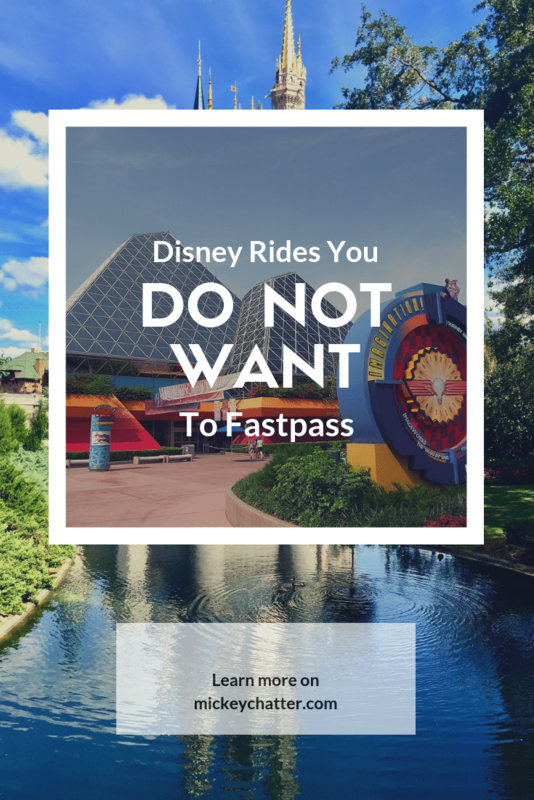 Now while you may read a lot about which rides you must get Fastpasses for, there are also some that are not worth wasting a Fastpass on. 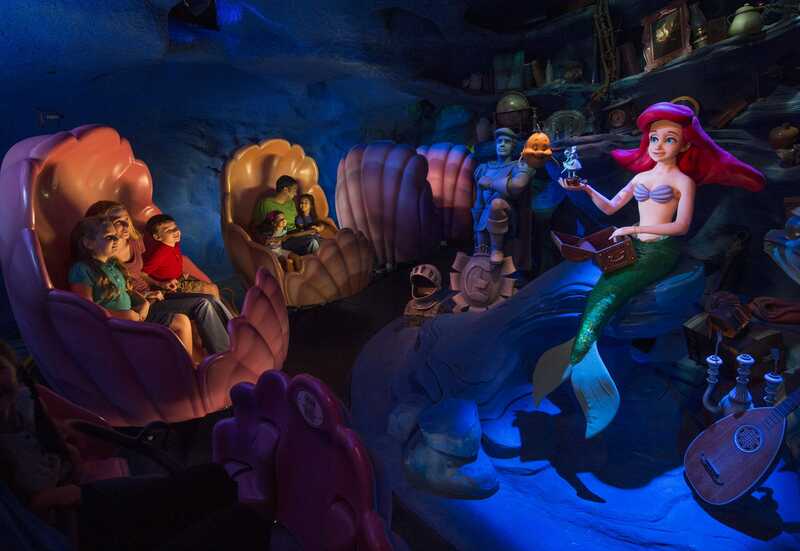 If it is your first time visiting Disney World, then you may not know which rides you should choose. I am going to provide you with a list of rides that you should not bother getting a Fastpass for. These rides often have very short waits and you can just walk on most of the time. Oftentimes, I only see this ride with a 5 minute wait, but even at the busiest times, it’s never very long. I think a lot of people skip it because of the spinning, so it isn’t a very popular attraction. A Fastpass is never worth it for this ride because you can definitely ride it with a short wait without one. This is a 3D show that you watch in a large theatre. I never really understood why they offer Fastpass for this because there never really is a line to get in. Once you enter, you will just be ushered in to the general waiting area with everyone else to wait to get in to the theatre. Using Fastpass gives you no advantage for this attraction. This is a ride where you can often find no lines at all at certain times of the day. If you go do this ride within the first hour of the day, or during parades/fireworks, then you won’t need a Fastpass. The wait time often says 10 minutes, but that is just the time it takes to walk through the queue because it is a bit of a walk. Often when it says 10 minutes, that means it is a straight walk through with no wait. This is a comedy show and using Fastpass won’t really get you anything special. Once you pass through the Fastpass podium, you’ll just end up in the holding area with the rest of the guests waiting for the show. Because of that, it really is a waste of a Fastpass. Not to mention, you never really have to wait very long, it’s basically until the next show starts, which is about every 10-15 minutes. Using a Fastpass will never get you in any earlier than the next show. You can often find short lines for this ride, especially if you go first thing in the morning or within the last hour of park closing. Even during the day, during non-peak times, you can find this ride with a 10-15 minute wait. I have never used a Fastpass for this ride and have also never waited very long to ride it. This ride is almost always a walk-on, I have never seen it have a waiting line. Maybe if you go during the Christmas holidays, there may be a bit of a line, but not long enough to warrant a Fastpass. Save the Fastpass for the rides in Epcot that really need it. This is another ride I have never seen a line for. The wait time will always say at least 10 minutes, but that is because it takes a few minutes just to walk through the queue. The queue line is a bit of a walk, but you will most probably never get caught in any kind of line trying to get on this ride. So save your Fastpasses for the rides that really need it, it’s the best way to maximize your time touring the parks. 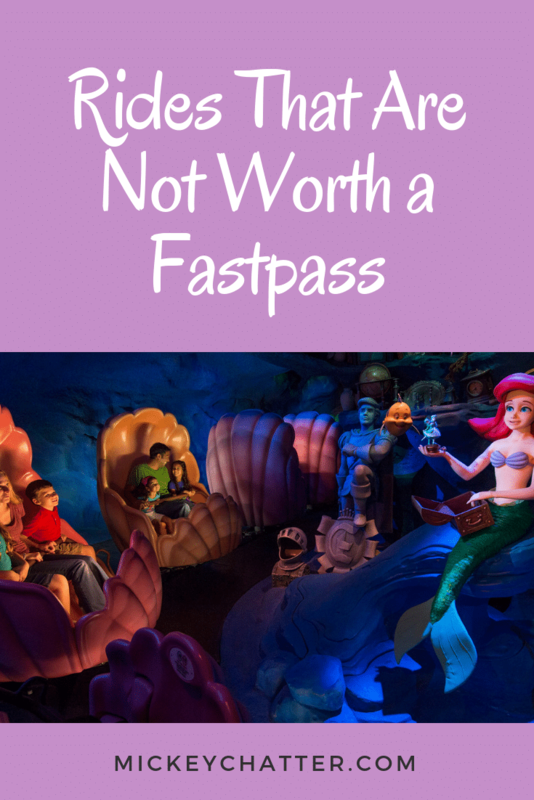 What are the rides that you will never use a Fastpass for? Tell us in the comments below! If you would like personal help from a travel planner that specializes in Disney to help you choose your Fastpasses and design your itinerary, then you can get in touch with one at Click the Mouse. They are a Disney Earmarked agency and will provide you one-on-one help to plan out all the little details of your magical vacation at no extra cost to you. When Is The Best Month to Visit Florida? Not sure when this was posted, but I’d have to disagree with the Under the Sea and Seas with Nemo & Friends. We go to Disney every year and have usually seen waits for these rides. Right now, the wait for Under the Sea is 30 minutes and for Nemo it’s 45 mins. Even Mad Tea Party and Aladdin’s Magic Carpet has a half-hour wait time. There aren’t even any more FastPasses available for Under the Sea for a day we’ll be at the Magic Kingdom this trip. 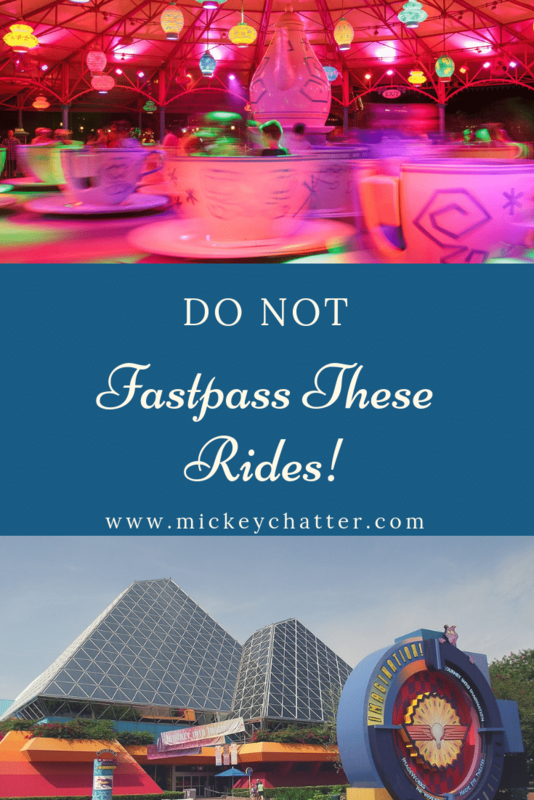 Before writing these rides off as not needing a FastPass, make sure you consider when you’ll be at Disney. If you’re going during a peak season, you’ll be waiting in a long line w/o a FastPass. Thirty minutes may not seem bad compared to the 2-hour wait time for rides like Seven Dwarf’s Mine Train, but 30 mins can seem like 2 hours if you have a little one that’s getting tired or you’re tired and need to sit down.